Last week, we finally gotten more information that the sale of IREIT Global’s manager will take place. 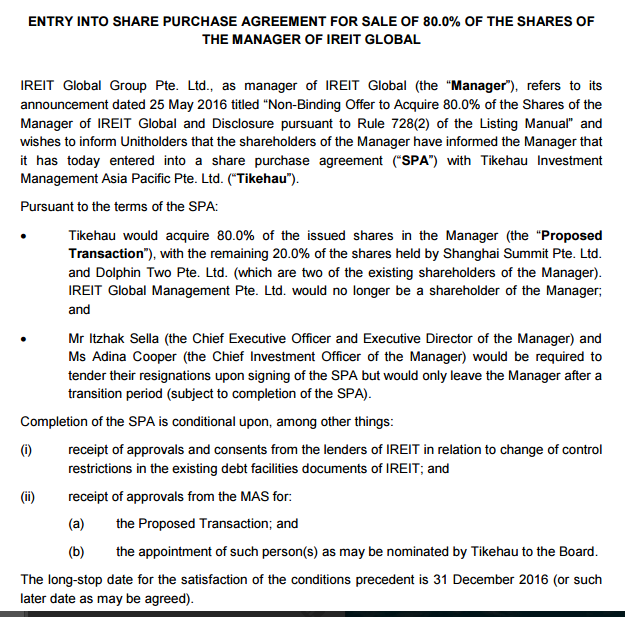 The new management now will control 80% of the REIT manager with the other 20% held by Shanghai Summit group, which is Tong Jinquan’s vehicle. There will be movement in terms of personnel as well. The current CEO and CIO would have to resigned. They are also expanding their investment mandate to cover all commercial income producing assets across Europe. I thought this is a big move. When you remove management, it is either you want to out someone more competent in the position, you want this vehicle to shift its direction and want less resistance. I certainly feel it is the latter. However, there is always chances I am wrong in that, if the mandate is to expand the kind of assets this Reit can take in, and the manager lacks competency in more markets then required, and that the potential risk of mismanagement is small because they got someone just as able in competency, then replacing the CIO and CEO will make sense. We can’t escape any discussion of IREIT at this point without discussing Tikehau Investment Management Asia Pac. Tikehau Asia Pacific is only set up not too long ago. They just start forming their Asia team last year. Tikehau was started in France by Merrill Lynch Bankers. They look to be bankers first and foremost than asset managers. If you read through their real estate strategy, they have started a French REIT and have taken stakes in listed REITs. They manage 900 mil Euro of asset with a potential of 1 bil Euro of asset pipeline. Why would they want a Reit listed in Singapore, which own assets in Germany, managed by an Israeli and majority own by a Chinese? Asset managers when they acquire or merge with another similar one, tends to work out because they try to solve the problem of finding new clients to market existing funds to, and to find new funds to market to existing clients. That is the story behind USA merger of Janus Capital and UK Henderson Global. When we look at Ara Asset Management, their REIT portion have been lucrative because the fees are good, and that it does not require seed capital to grow, unlike their recent private funds venture. To kick start their private fund they will need to commit at least 10% of their capital. It is not asset light. The most plausible guess is that they have a pipeline and couldn’t inject easily into their existing REITs and real estate funds. As investors, I think unless I have some insider track on the motivations of the various stake holder, I cannot form a high probability picture this is beneficial or not. We will probably have to take a look at the first deals being made. We should be basing our investment decisions more on whether there are value add to the takeover or value destruction. What do you guys and gals think? Do you have some expert sensing to this move? What’s “interesting” is that Temasek invested in Tikehau, probably to get exposure to the asset management business in Europe, while Tikehau decides growth lies in Asia? 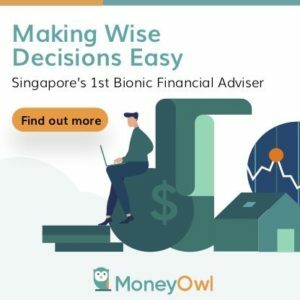 hi Dee, read about this, and honestly not a big fan of Temasek’s foresight.